Banksy is one of the most famous street-artists in the world. Thanks to his works, created with the technique of stencils, he has been able to approach the great public to the world of contemporary art thanks to the immediateness of the messages in his works. 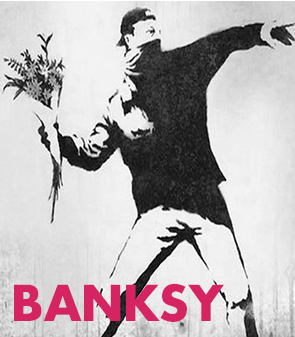 "Banksy" is a pseudonym and, concerning his true identity, there is for a long time a halo of mystery around his figure. Perhaps, actually undoubtedly, the artist's anonymity has contributed to the creation of the myth of his image. From the years 2000 the career of Banksy has been all in ascent. In 2003 he collaborated with the Blur, famous English musical group, drawing the cover of the album Think Tank. In 2005 he painted in Cisgiordania some murals on the barrier built from Israel to separate the two territories. In 2008 he organized the Cans Festival, devoted to stencil art, in an abandoned tunnel in London, with the aim to make ironic reference to the Festival of Cannes, really beginning from the title. The event received a lot of public success and a lot of artists from all over the world participated in it. In 2010 Banksy also produced a documentary, Exit through the Gift Shop, in which, always with the darkened face and the counterfeit voice, he tells the history of Thierry Guetta, a French that turns into the famous street artist known with the name of Mr. Brainwash. In concomitance with the exit of the documentary, the artist began to carpet the principal American cities with his works, which refer to important thematic always through concrete and immediately comprehensible images. Besides, impatient to the usual systems of art diffusion and production, in sign of protest Banksy secretly hangs in the more known art galleries some reproductions of famous artworks inserting however details absolutely anachronistic. Banksy has become an icon of the popular culture and he is very desired in the field of the art market and the value of his artworks will keep on growing: his works worth million of euros, when only few years ago the artist himself sold his sketches in a stand for about few dollars.